Centaurus A (NGC 5128) is a giant galaxy that looks like a normal elliptical except for the dust bands encircling it’s “waist”. This image comes from ESO’s 2.2 meter telescope at La Silla, Chile. It shows a fluffy sphere of star clusters that is about twice the diameter of a denser core, also made of star clusters. Astronomers sometimes classify Centaurs A as part elliptical and part spiral (lenticular). It does not display the disk-like shape of a spiral, yet it has a narrow band around it. Here is a picture of the dust lanes in Centaurus A from the millimeter / sub millimeter ALMA telescope. Numerous small companion galaxies (the white specs) are arranged in strings roughly perpendicular to the dust lanes. Image credit: ALMA (ESO/NAOJ / NRAO); ESO /Y. Beletsky. The next picture is a composite that shows enormous red radio emitting lobes. The lobes are so huge that they cover about 20 times the area of the full moon. 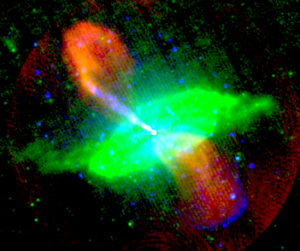 At the center of the galaxy a bi-directional X-ray jet is connected to the radio lobes. Clearly highly energetic matter in two jets emerges from the center of this galaxy. At the end of the southern radio lobe is a blue X-ray shell, evidently a shock wave. Observations with the Very Long Baseline Array (VLBA) suggest that the source of the two jets is only about 15 times the diameter of our solar system. The green is thermal radiation from infrared. Image is under a GNU Free documentation license from Martin Hardcastle. Clearly Centaurus A has had a long history of spreading out. Evidently, much of this spreading came from a point like core. How do scientists explain Centaurus A’s activity? They claim a black hole, containing the matter of hundreds of millions of suns, lies at the center of the galaxy. The black hole allegedly grew by gravitating together lots of space dust. What causes the X-ray jets and radio lobes? The black hole is said to spin rapidly and this allows it to eject high speed matter at the poles. Why can’t we see the hole? Allegedly its gravity is so powerful that light cannot escape. Why does the jet emerging from the core not even bend, if there is so much gravity? Supposedly, the hole’s magnetic field is so powerful that it collimates the jet. What produced the dust lanes? 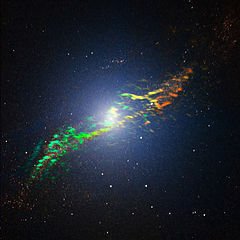 Allegedly, Centaurus A collided with and absorbed a small spiral galaxy. The Hebrew text of Genesis has a simpler explanation. Genesis 1:1 – First God finished the creation of the heavens and the earth, the entire universe. Genesis 1:2 begins with the Hebrew waw character that indicate “and, then or but.” But the early Earth was dark and unformed. What actualized Earth’s matter, giving it extension? Elohim’s wind dithered in unbroken continuity above the dark unformed Earth as He continued to command light to continue to be. (The Hebrew verbs indicate continuing commands and actions). To this day, light continues to dither around within matter, giving it extension. The Scriptures does not tell us how the matter in the rest of the universe began to have extension. However, it does explain that the same laws on Earth are also applicable in the heavens (Job 38: 33). If the heavens and Earth follow the same laws, surely their matter has a similar structure and history. Lets assume that the galaxies received form as God continued to command light to continue to be, just as occurred with Earth’s matter. This fits the text since half way through the creation week, Elohim continued to command lights in the heavens. He continued to form (not create) the Sun, Moon and stars and continued to make them into things that spread out (Hebrew raqiya). Evidently He continued to form them from the unformed matter created first by commanding light to continue to be. Indeed, detectors on spacecraft observe powerful flashes of gamma light periodically arriving from the early universe. Perhaps this is God energizing and actualizing the unformed things he created first, giving them extension, with the most powerful light know. At many ranges we see how billions of galaxies grew. The stars continued to emerge and come out from things unseen. Galaxies grow as baby galaxies, globular clusters and gas jets continue to emerge. This is most prominently visible in the history of how spiral galaxies formed as they grew into huge growth spirals as countless star streams continued to emerge. Even local stars are observed to shoot out bi-directional gas jets as they form huge, dusty nebulae around them. 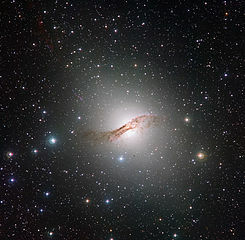 Evidently Centaurus A grew from unformed matter in the core, as did billions of galaxies at many ranges. A western person might insist that this cannot be biblical, since the creation happened only 6,000 years ago. Please look at the universe. We see that the atomic clocks accelerate along with the outward accelerating jets and star streams. Our ancestors, a few hundred generations ago, mention how the planets passed at close range and one was shattered, evidently in a collision. The Bible also mentions these things. If you wonder how orbits could continue to accelerate along with the accelerating atomic clocks, read about gravity on this web site.